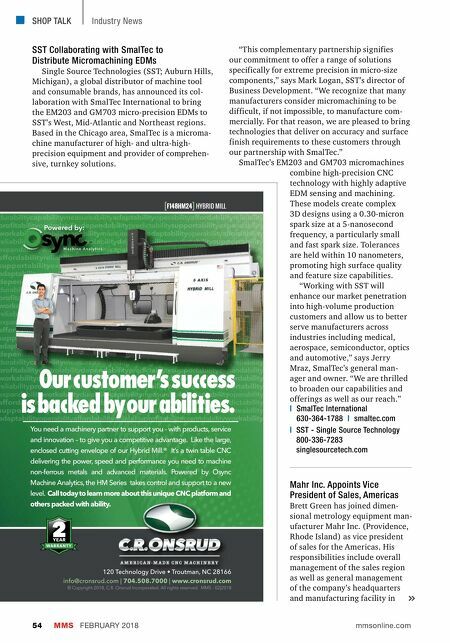 SHOP TALK MMS FEBRUARY 2018 54 mmsonline.com Industry News SST Collaborating with SmalTec to Distribute Micromachining EDMs Single Source Technologies (SST; Auburn Hills, Michigan), a global distributor of machine tool and consumable brands, has announced its col- laboration with SmalTec International to bring the EM203 and GM703 micro-precision EDMs to SST's West, Mid-Atlantic and Northeast regions. Based in the Chicago area, SmalTec is a microma- chine manufacturer of high- and ultra-high- precision equipment and provider of comprehen- sive, turnkey solutions. "This complementary partnership signifies our commitment to offer a range of solutions specifically for extreme precision in micro-size components," says Mark Logan, SST's director of Business Development. "We recognize that many manufacturers consider micromachining to be difficult, if not impossible, to manufacture com- mercially. For that reason, we are pleased to bring technologies that deliver on accuracy and surface finish requirements to these customers through our partnership with SmalTec." SmalTec's EM203 and GM703 micromachines combine high-precision CNC technology with highly adaptive EDM sensing and machining. These models create complex 3D designs using a 0.30-micron spark size at a 5-nanosecond frequency, a particularly small and fast spark size. Tolerances are held within 10 nanometers, promoting high surface quality and feature size capabilities. "Working with SST will enhance our market penetration into high-volume production customers and allow us to better serve manufacturers across industries including medical, aerospace, semiconductor, optics and automotive," says Jerry Mraz, SmalTec's general man- ager and owner. "We are thrilled to broaden our capabilities and offerings as well as our reach." | SmalTec International 630-364-1788 | smaltec.com | SST - Single Source Technology 800-336-7283 singlesourcetech.com Mahr Inc. Appoints Vice President of Sales, Americas Brett Green has joined dimen- sional metrology equipment man- ufacturer Mahr Inc. (Providence, Rhode Island) as vice president of sales for the Americas. His responsibilities include overall management of the sales region as well as general management of the company's headquarters and manufacturing facility in durabilitycapabilitymeasureabilityadaptabilityoperabilityaffordabilityreliability profitability controlabilitydependabilitypredictabilitysupportability expandability workability durabilitycapabilitymeasureabilityadaptabilityoperability affordability reliability profitabilitycontrolabilitydependabilitypredictability supportability expandability workabilitydurabilitycapabilitymeasureabilityadaptability operability affordability reliabilityprofitabilitycontrolabilitydependability predictability supportability expandabilityworkabilitydurabilitycapability measureability adaptability operabilityaffordabilityreliabilityprofitabilitycontrolability workability dependability predictabilitysupportabilityexpandabilityworkability durability durability capabilitymeasureabilityadaptabilityoperabilityaffordability reliability profitability controlabilitydependabilitypredictabilitysupportability expandability workability durabilitycapabilitymeasureabilityadaptabilityoperability affordability reliability profitabilitycontrolabilitydependabilitypredictability supportability expandability workabilitydurabilitycapabilitymeasureabilityadaptability operability affordability reliabilityprofitabilitycontrolabilitydependability predictability supportability expandabilityworkabilitydurabilitycapability measureability adaptability operabilityaffordabilityreliabilityprofitabilitycontrolability workability dependability predictabilitysupportabilityexpandabilityworkability durability durability capabilitymeasureabilityadaptabilityoperabilityaffordability reliability profitability controlabilitydependabilitypredictabilitysupportability expandability workability durabilitycapabilitymeasureabilityadaptabilityoperability affordability reliability profitabilitycontrolabilitydependabilitypredictability supportability expandability workabilitydurabilitycapabilitymeasureabilityadaptability operability affordability reliabilityprofitabilitycontrolabilitydependability predictability supportability expandabilityworkabilitydurabilitycapability measureability adaptabilityoperabilityaffordabilityreliabilityprofitabilitycontrolabilityworkability You need a machinery partner to support you - with products, service and innovation – to give you a competitive advantage. Like the large, enclosed cutting envelope of our Hybrid Mill.® It's a twin table CNC delivering the power, speed and performance you need to machine non-ferrous metals and advanced materials. Powered by Osync Machine Analytics, the HM Series takes control and support to a new level. 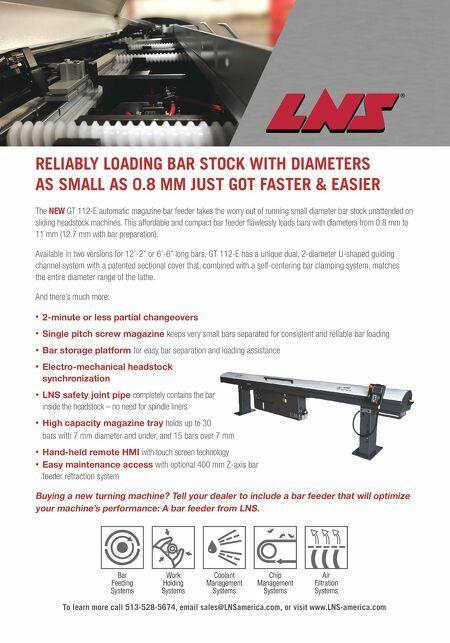 Call today to learn more about this unique CNC platform and others packed with ability. [ F148HM24 ] HYBRID MILL 120 Technology Drive • Troutman, NC 28166 info@cronsrud.com | 704.508.7000 | www.cronsrud.com © Copyright 2018, C.R. Onsrud Incorporated. All rights reserved. MMS - 02|2018 Our customer's success is backed by our abilities.